Crusting 4 months after asian eyelid crease surgery. This is my 4th revision the first couple dropped? Crusting 4 months after asian eyelid crease surgery. This is my 4th revision the first couple dropped? A discussion presented by Dr. Philip Young: Crusting after Asian Double Eyelid Surgery should not last more than 1-2 weeks. If the crusting lasts more than that, you may get scarring and difficult healing. I would have your facial plastic surgeon look at this situation as soon as possible. Otherwise, you might have a bad appearance from the scarring that could occur here. The dropping of the eyelid can occur more commonly with non-incision techniques. Also the skin to levator approach is dependent on scar tissue that can last and maintain the crease in a variable way. Meaning, the crease could last and persist differently in the eyes or asymmetrically in the eyes. This is due to the fact that these crease forming procedures are based on scarring to hold the crease. I carry out the Asian Eyelid Procedure in a unique way that lasts a long time. My procedure that I do is difficult, but once mastered makes a huge difference in terms of longevity. The procedure is uniquely called the orbicularis levator fixation technique. 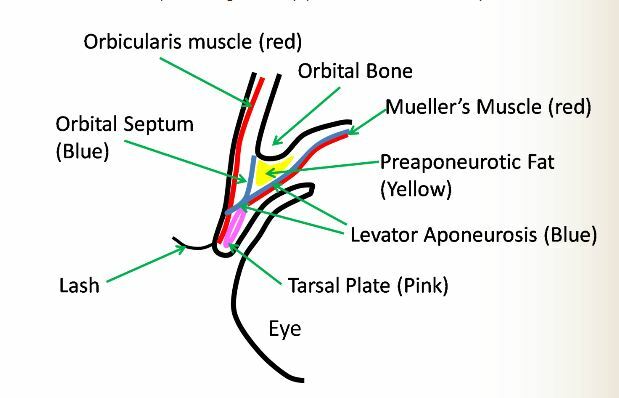 Below is the anatomy of the upper eyelid and will help you understand this technique once you follow the links to get to that page. This technique would be great for you because if you have a tendency to drop this technique actually leaves sutures inside your eyelid to hold your crease. These sutures stay in there permanently and this assures that the crease stays put and holds for the long run. 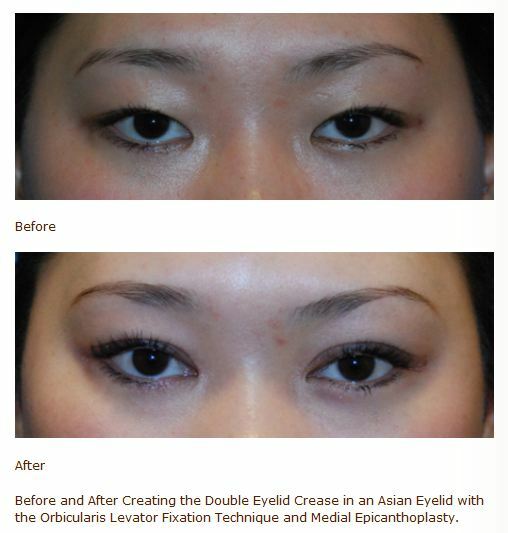 Posted in Asian Cosmetic Surgery, Asian Double Eyelid Surgery / Asian Eyelid Surgery, Blepharoplasty / Eyelift / Eye Lift / Dark Circles / Eye Bags | Comments Off on Crusting 4 months after asian eyelid crease surgery. This is my 4th revision the first couple dropped? My eyelid crease is too high 3 days after Asian Double Eyelid Crease Surgery? What can I do? My eyelid crease is too high 3 days after Asian Double Eyelid Crease Surgery? What can I do? A Case Presentation by Dr. Philip Young: Asian Eyelid Surgery: Early on the crease is much higher than will be the final result. The eyelid crease always looks much higher early on after Asian Double Eyelid Crease Formation. The swelling tends to take up the space of the skin that would normally fold over the crease. You don’t want to do anything at this early point in time. Your doctor will know best. The earliest that any Asian Eyelid Surgeon Specialist would do something would be at 2 weeks’ time. Don’t worry this will settle. You always have the option of making the crease lower if you desired or higher if you desired. There are many options. Posted in Asian Cosmetic Surgery, Asian Double Eyelid Surgery / Asian Eyelid Surgery, Blepharoplasty / Eyelift / Eye Lift / Dark Circles / Eye Bags | Comments Off on My eyelid crease is too high 3 days after Asian Double Eyelid Crease Surgery? What can I do? 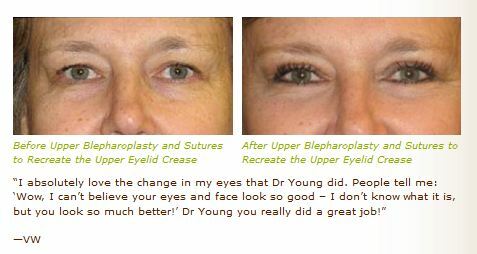 Asymmetric eyelid folds options for treatment by Dr. Philip Young of Seattle: Asymmetry is found in all of our faces. Around the eyes and periorbital region, differences are much more apparent. 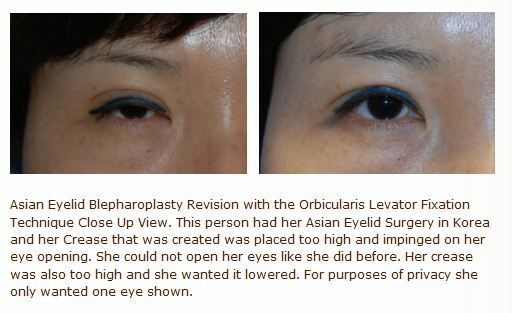 This is some of the reason why Revision Asian Blepharoplasty Double eyelid surgery is so difficult. There are ways to make the eyes look more symmetric. You can excise more skin. You can reset the crease at a higher or more inferior position. You can set the crease more laterally and medially to make things more symmetric. You can fat graft one or both of the eyelids or remove fat to make them more symmetric. The options and the process on how you do it can be endless and infinite. Asian Double Eye Lid Surgery and Swollen Crease one year later? 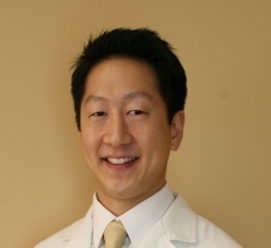 presented by Dr. Philip Young of Bellevue | Seattle: One year is a little lengthy after Asian Double Eyelid Crease Surgery. Ultimately, I would need to visualize your images or in person. It is possible that this swelling / induration / thickening could be from scar tissue, it could be due to the crease being set too high / too inferior, it could be due to the crease not being set deep enough and some thicker tissue that was incorporated into the crease. Sometimes the swelling is related to the thicker brow tissue being pulled over the crease. All reasons necessitate different methods of correction. You are welcome to email me pictures and I can do a phone or video consult. I have people from all over the world carry out consults with me remotely! I look forward to hearing from you. You can also read more at our Asian Cosmetic Surgery WebPage.